All the atoms of a particular element have the same number of protons. This proton number or atomic number determines the chemical properties of an atom. However, the number of neutrons may vary within the atoms of an element. Atoms of the same element with the same atomic number but different atomic masses are called isotopes of that element. 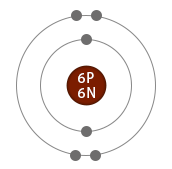 The atomic number of carbon is 6. All carbon atoms have the same atomic number, but their mass number might differ because of different number of neutrons. Most of the carbon atoms contain 6 protons and 6 neutrons, and has a mass number 12. However, some carbon atoms also exist with 6 protons and 8 neutrons, which gives it a mass number 14. 12C and 14C are isotopes of carbon.